I mentioned a few weeks back that I was taking a break from Melbourne winter, work and life in general to travel through Israel and Europe for a month. To keep up with the blog, I ate double spag bol portions in the lead up to my travels to ensure regular posting while I was away. When I thought about the food I would be eating in Israel, dishes like hummus, falafel and schnitzel sprung to mind. I was absolutely blown away by the variation and high standard of food presented in Tel Aviv – I had some mind blowing meals both traditional and international cuisines. Tel Aviv is without a doubt a world food hotspot. I went to a restaurant called Rustico for my bolognese fix. It’s situated in the trendy area of Allenby and Rothschild streets. Wow is all I can say. 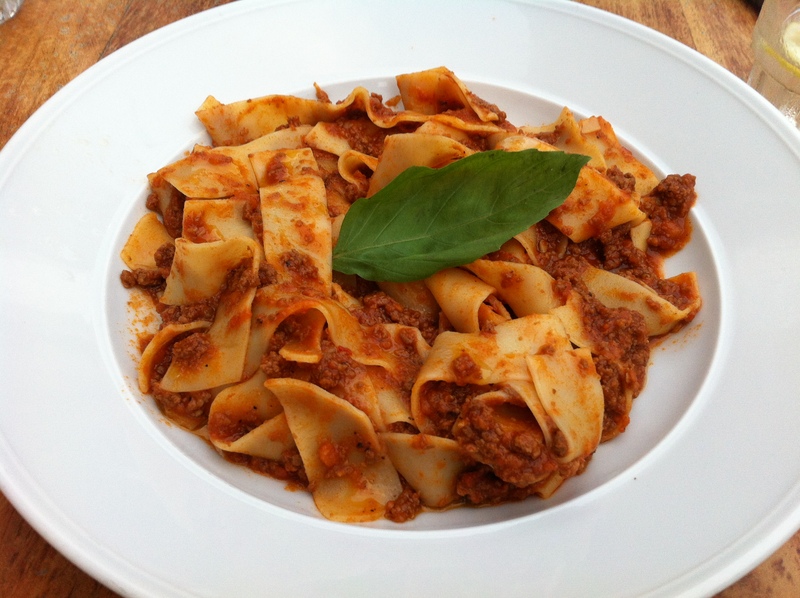 Boy did this Bolognese give Melbourne (and Italy) a run for their money! It was nearly perfect. The pasta used was Papardelle and it was cooked to perfection. The sauce was out of control good with the appropriate balance of tomato and meat alongside a near perfect combination of sweetness and acidity. What I loved most was the rich developed flavour – the sauce must have been simmering away for several hours to get that flavour. The consistency of the sauce was spot on – the right amount of thick to coat the pasta. The meat clumps were a little fine for my liking, but they were tender and flavoursome which is most important. *As this is an overseas feature, it will not be included in the competition for Melbourne’s best Bolognese.